Don't be fooled, the movie's in color. Gong Li and Li Xuejian in The Emperor and the Assassin. The Skinny: A return in style for Chen Kaige, whose last 10 years have been a mix of highs (Farewell My Concubine, Life on a String) and depressing lows (Temptress Moon, Killing Me Softly). The Emperor and the Assassin is epic in scope and much more historically relevant than the Chinese government may believe. A rewarding yet demanding experience. "When the Map is Unrolled, the Dagger is Revealed." This is a famous figure of speech in China, which fits Chen Kaige's latest epic drama perfectly both in story and meaning. It means that only at the end we see people's real intentions and their true nature. The film narrates the story of China's First Emperor, King Ying Zheng (who would later become Qin Shi Huang), who united the seven kingdoms in 221 B.C. to end the bloody era of The Warring States. The figure of Ying Zheng (Li Xuejian) assumes gigantic proportions in this near-Shakespearean tragedy. He's painted as a fair and just man at the beginning, but he eventually submits to his thirst for power and the dogma of his ancestral mandate. Thanks to an amazing performance by the great Li Xuejian (Shanghai Triad, The Blue Kite), we witness a man who changes drastically. Thanks to pressure and paranoia, Ying Zheng betrays his initial intentions - which were to unite all of China peacefully and lead it to years of prosperity. That's what he initially promises. However, like most politicians, the promises become dead air when he finally reaches his goals. One of Ying Zheng's concubines and the love of his life, Lady Zhao (Gong Li), functions as a counterpoint to the Emperor. A fictional character, she's used by the director to give voice to the masses. She represents people who want humanity to prevail over bloodletting and power-thirsty dictators. These are the people who weep over the senseless loss of life, and want a peaceful solution instead. The film is structured into five acts which lay the groundwork for the final part in which the reluctant assassin Jing Ke plots to kill Ying Zheng. The intricate story might be difficult to follow for someone who's not used to Chinese history, but the script flows well and the characters are developed so effectively that such apparent shortcomings don't really matter at the end. Chen Kaige could have decided to focus on a history lesson, but instead he's more interested in three central characters (Ying Zheng, Lady Zhao and Jing Ke) and their motives. He's able to create a psychological profile for Ying Zheng, who at first seems in control, but ultimately is the cause of his own undoing. His attempts to bring peace and prosperity to his kin conflict with the danger of holding too much power in one's hands. He can't handle the situation and the consequences are terrible. And guess who pays the price? The same people he was trying to "help". Jing Ke (Chen regular Zhang Fengyi, in another very good performance) is portrayed in a different way as well. In the Records of the Historian (Shih Chi or Shiji) he was a common man who helped people and was well liked. In the film, he's presented as a professional killer who encounters a life-changing crossroads. 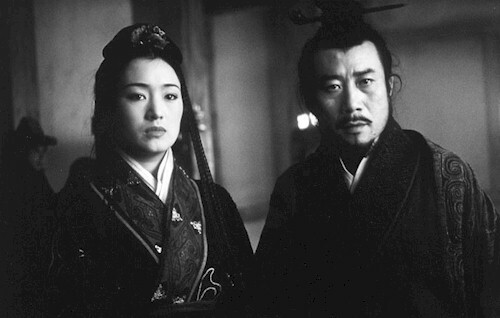 His relationship with Lady Zhao (Gong Li) helps her realize how the king's promises are just a hoax to hide his thirst for power, which in turn shapes the final part of the film. Lady Zhao's character ultimately becomes the face of humanity. She's a woman who can control herself except under tragic circumstances, and Gong Li's performance underlines those traits. You could say Ying Zheng's maniacal change of mind represents China's leaders (they use political dogma to solve their problems at the people's expense) and Lady Zhao is the people's hopes and fears. She's the one who can change things but sadly it's not up to her to shape history. The film centers around the three main characters and decides to only hint or show a glimpse of their struggles, for it's the central themes that matter, and not the actual events. In showing the aftermath and not the actual battles, Chen drives home his message in a better way. Instead of being shocked by the onscreen acts, we're left to reflect on the consequences, and to attempt to learn from them. For a film which boasts thousands of extras, incredible sets, awe-inspiring landscapes, and large scale battles, it's surprising that character development and superior storytelling are what make the film succeed. Everything looks authentic down to the tiniest detail, and the cinematography and art direction amplify that. Simply put, this is one of the most beautifully shot films of all time. The battle sequences in The Emperor and the Assassin rival Ran and Kagemusha in scope and realism, even if they're not the focus of the film. Furthermore, Zhao Jiping's soundtrack and the superior acting (including a supporting performance by Chen Kaige as Lu Buwei) help make the film one of the most engrossing, captivating epic dramas of recent memory. What's surprising about the film is not its historical accuracy, but the fact that something that happened more than 2200 years ago could be so relevant today. The old saying that to predict the future you need to look back at the past seems to be what Chen Kaige was trying to communicate. The film seems to be more than an adaptation of a classic story; there's also the feeling that what's happening onscreen is meant to somehow mirror Modern China and its relations towards countries like Taiwan. Ying Zheng's mandate from his ancestors to unite all of the kingdoms reminds us of the hope of reunification that we see today. However, the way he works towards that goal brings back dark memories most would rather forget. Those memories are of an event everyone should be familiar with: Tiananmen Square. One of the most powerful scenes in the film occurs when Lady Zhao weeps over the dead bodies of her people. This scene, more than any other, underscores the horrific feelings left behind by the massacre. Notes:  The Mei Ah DVD is unfortunately a flipper, and doesn't even subtitle the final credits. Those credits note that Ying Zheng's corpse is still preserved in a tomb at Xian, and that he united the seven kingdoms to become China's first emperor. However, he also died a year later (220 BC) and the Qin empire came to an end less than 10 years after.